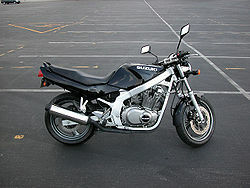 From 1976 to 1987, Suzuki produced its GS line of motorcycles. These motorcycles had air-cooled DOHC engines with 2 valves per cylinder (as opposed to the GSX series which had four valves per cylinder), which spanned a wide range of cylinder capacities. It is considered to be a Universal Japanese Motorcycle. When introduced in 1976, Suzuki offered the GS750, GS550 and GS400 models. Earlier Suzuki motorcycles were two-stroke. As the flagship of the Suzuki line, the GS series was succeeded by Suzuki's GSX and then GSX-R motorcycles, which had oil (GSX) or liquid cooled (GSX-R) engines. However, the GS series is still produced as relatively affordable bikes, possibly used by learners in some jurisdictions, such as the GS500E (naked) and GS500F (fairing). While one of the best performing sportbikes of their era, the GS series bikes are still good all-around machines as they approach their vintage years. From 1976 to 1987, Suzuki produced its GS line of motorcycles. These motorcycles had air-cooled in-line DOHC engines with two or four cylinders, two valves per cylinder and displacements between 250 and 1100cc. The four-cylinder variants are considered to be Universal Japanese Motorcycles. 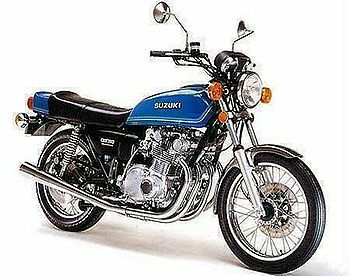 When introduced in 1976, Suzuki offered the GS400, GS550 and GS750 models. Earlier Suzuki motorcycles were two-stroke. This was something of a liability for Suzuki at the time, for while their two-stroke line of motorcycles was well regarded, impending air quality legislation in the US would see two stroke motorcycles banned for sale there due to their notoriously filthy emissions. A short reprieve for the two stroke would occur in the 1980s when Yamaha sold a much more environmentally friendly RZ350 motorcycle, but the era of the two-stroke street motorcycle had passed by then, at least in America. Weird designs like the Wankel-engined RE5 were clearly not the answer. This left Suzuki in a bit of a bind. If they were to compete effectively in the largest motorcycle market in the world, they needed a four stroke model, and fast! Their solution was to virtually copy the 900cc Kawasaki Z1 engine and release it as the 750cc GS. It was an immediate hit, boasting a top speed approaching 130mph, excellent handling and handsome lines. The engine shared the Kawasaki's trait of being virtually indestructible, and thrived on high speed work. The arrival of the larger GS1000 put it in the shade somewhat in terms of all-out performance, but it remained a popular and capable motorcycle in its own right. The Suzuki GS1000, on the other hand, proved that the Japanese could build a big, fast four cylinder motorcycle that actually handled, something Kawasaki never quite managed with the fast, but loose handling Z1. It likewise inherited the Kawasaki's stout nature, and the two motorcycles were destined to meet head to head on drag strips for years to come. Heavily modified from stock, these motorcycles nevertheless proved reliable, while putting out several multiples of the horsepower they were originally designed to produce. The GS1000 sported a few new ideas, the rear suspension on the EC model and the front forks had the facility of an air valve in which (small) amounts of air could be added to change preload. The GS1000S had a small bar mounted fairing with extra clocks mounted, plus larger carburetters, taking power to 90PS. The GS1000G was more of a touring bike with shaft drive, which added a fair bit of weight. The arrival of Honda's exotic six cylinder Honda CBX stole the GS's thunder for a short while, but a redesign of the engine from an eight valve to a sixteen valve (as the GSX1100) improved its performance substantially, without compromising its reputation for reliability in any way. It soon had the beating of the CBX, which slowly mellowed into a sport-touring motorcycle with fairing and panniers before disappearing altogether from Honda's lineup. Perhaps the only Achilles heel in the GS design was an overly fussy electrical system which was prone to failing quite spectacularly. The dreaded regulator/rectifier break down led to much pushing and sweating for unlucky GS owners. If fortunate, the regulator/rectfier would be the only casualty. If unlucky, the entire charging system was wrecked (along with every bulb on the bike), leading to an expensive repair. The smart GS owner replaced the original Suzuki parts with stronger aftermarket items (usually at a lower cost), although regulator/rectifiers from some Honda models have been successfully adapted to cure the problem once and for all (Honda Superdream/450 Nighthawk units). A thorough discussion of all GS Suzuki would require its own reference book. Suffice it to say, the GS line of motorcycles was one of the most versatile, durable, powerful, and comfortable designs ever produced by any Japanese motorcycle manufacturer. From 125cc to 1100cc, there was not a deficient model in the entire line. As the flagship of the Suzuki line, the GS series was succeeded in the early 1980s by Suzuki's GSX motorcycles with four valves per cylinder. The only "surviving" member of the GS series has a bored GSX 400 engine with a redesigned two-valve head. It is still produced as relatively affordable entry-level bike, the GS500E (naked) and GS500F (fairing). In Japan and possibly other jurisdictions, it is offered with 400cc due to restrictions imposed on learners. Pages in category "Suzuki GS series"
This page was last edited on 21 January 2011, at 15:43.